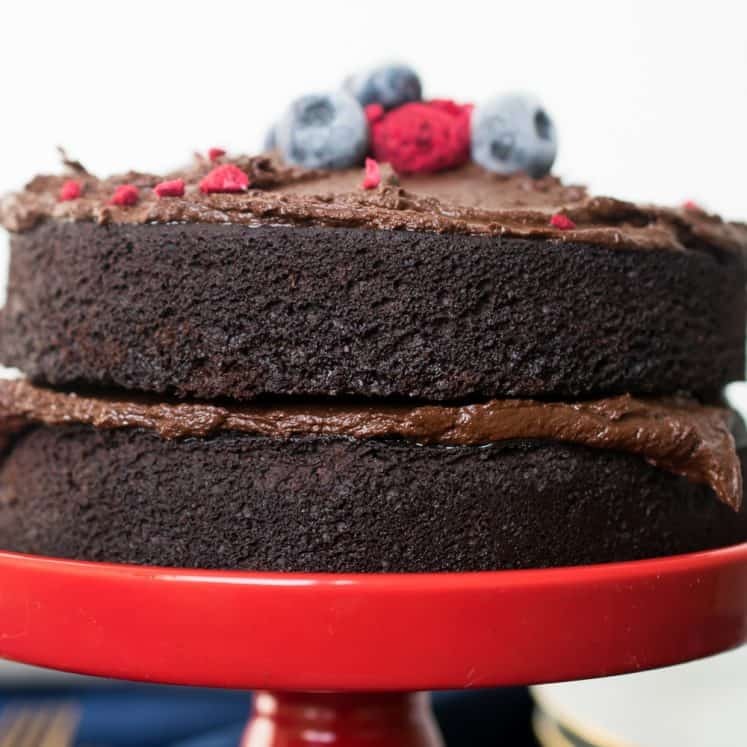 A delicious and moist Low Carb Dairy Free Chocolate Cake. Preheat oven to 350F. Lightly grease 2 6″ cake molds and set aside. In a large bowl, whisk together the cacao powder, coconut flour, granulated sweetener, baking soda and salt. In a small bowl, whisk together the eggs, coconut milk, oil, vanilla and stevia. Add the wet ingredients to the dry ingredients and whisk until a thick batter forms. Slowly add in the boiling water and stir until the mixture softens and smooths out. Divide the batter between the cake molds and bake for 30 minutes or until the cakes are rounded and firm to the touch. Remove from the oven and let the cakes cool in the pan before removing. Run a spatula around the cakes before unmolding and let them cool completely before decorating. To make the ganache: Chop the chocolate and put in a large microwave-safe bowl. Microwave 30-40 seconds, until soft and melting. Whisk vigorously until smooth. Slowly pour in the coconut cream and whisk until cool, smooth and glossy. Use a rubber spatula to spread half the ganache over one cake in a thick layer. Then place the second round over it. Spread the remaining ganache over the top of the cake and garnish with berries. For muffins, use a muffin tin with liners. 1/4 cup batter per muffin, makes 12, and bake 20-25 minutes. For a coconut free version, replace the coconut flour with 1 cup ground golden flax seed and follow the recipe as written. Use your preferred nondairy milk instead of coconut milk in the cake. For the ganache use cashew cream or heavy cream instead of coconut cream.